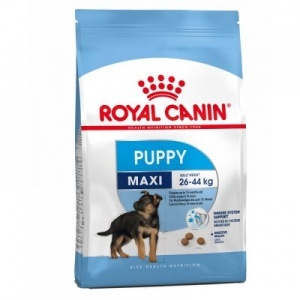 ROYAL CANIN MAXI PUPPY - FOOD FOR LARGE BREED PUPPIES. Complete and balanced food for large breed junior dogs (adult weight over 26kg). Premium quality ingredients. Energy control: To satisfy the requirements of a long and delicate growth. 4000 Kcal/Kg: To optimise weight gain and skeleton solidification. Calcium optimum: For a steady development of the skeletal structure. Acti Digest formula: For an optimal digestive safety. Maize; dehydrated poultry meat; maize flour; Beef fat; dehydrated poultry liver; beef greave meal (dehydrated beef protein); poultry fat; dehydrated fish; beet pulp; rice; vegetable oil; fish oil; minerals; trace-elements (including chelated trace-elements); fructo-oligo-saccharides; DL-methionine; egg powder; casein; vitamins.